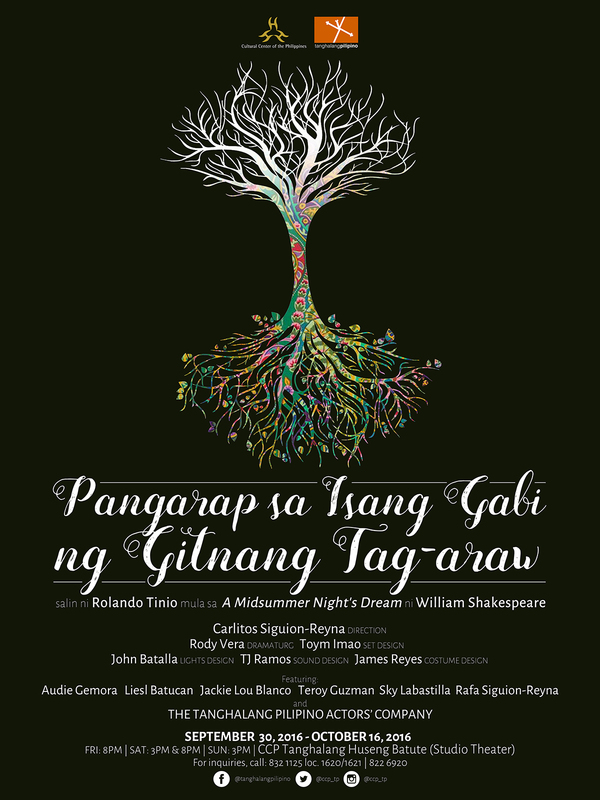 Tanghalang Pilipino ushers in its second production for the 30th season Transformance with the enchanting, Pangarap sa Isang Gabi ng Gitnang Tag-Araw at Tanghalang Huseng Batute (Studio Theater) of Cultural Center of the Philippines on September 30 to October 16, 2016. 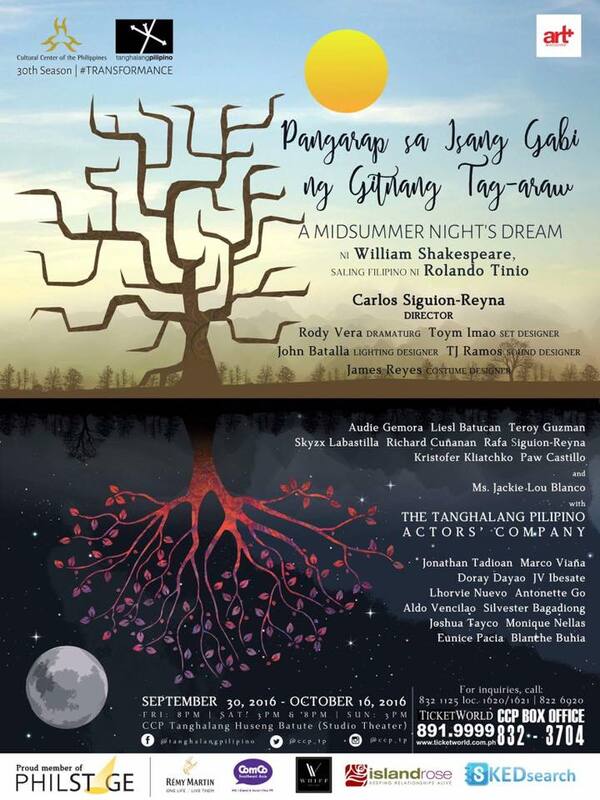 Pangarap sa Isang Gabi ng Gitnang Tag-Araw, an adaptation of William Shakespeare’s classic, A Midsummer Night’s Dream from Rolando Tinio’s Filipino translation, follows one of Shakespeare’s most popular works. The comedy centers on the events surrounding the marriage of Duke Theseus of Athens to the Amazon queen Hippolyta, and follows the stories of a band of fairies, a troupe of players and an Athenian love triangle between Hermia, her lover Lysander and suitor Demetrius. In this unique adaptation by Carlitos Siguion-Reyna, the audience will experience the powerful juxtaposition of two worlds—Athens, the home of the powers-that-be, rigid and structured, vis-à-vis the home of enchanting creatures, the forest, a place where unbridled passions run free. 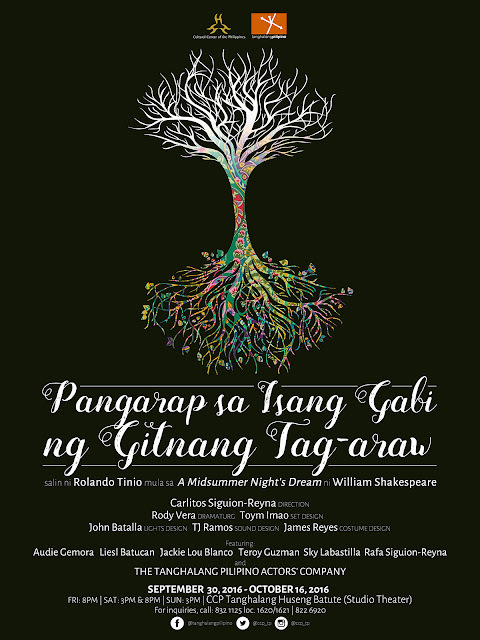 “Watch Pangarap and experience a story of virtual love, rejection, and emotional transformation,” invites Nanding Josef, Artistic Director of Tanghalang Pilipino. The cast includes Philippine theater’s most brilliant stars like Audie Gemora (Oberon), Liesl Batucan (Titanya), Jackie Lou Blanco (Hipolita), Skyzx Labastilla (Hipolita), Teroy Guzman (Teseo), Rafa Siguion-Reyna (Tisbe, Flute, and Ada), and the Tanghalang Pilipino Actor’s Company. 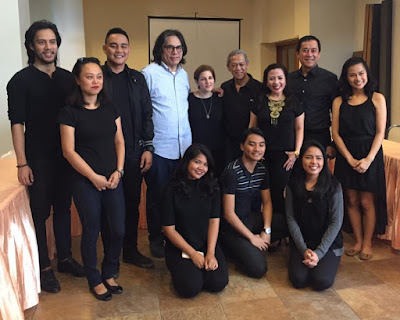 Notable members of the artistic staff include Rody Vera (Dramaturg), Toym Imao (Set Designer), John Batalla (Lights Designer), TJ Ramos (Sound Designer), and James Reyes (Costume Designer). Tanghalang Pilipino is the resident theater company of the Cultural Center of the Philippines. Established in 1987, it has successfully produced more than 200 shows locally and internationally. For more information, contact Tanghalang Pilipino Foundation, Inc. at (02) 832-1125 loc. 1620/1621 | Direct line: (02) 822 6920 | Lorelei Celestino: (02) 915 607 2275.